www.ascpskincare.com 47 expertadvice BUSINESS BASICS You Do You Try these three simple steps to create your unique brand identity by Lori Crete STEP 1: SHARE YOUR STORY Your why, your story, and your mission statement are unique to you and your business, and sharing this type of message allows consumers to quickly feel a connection with you and your off erings. It just makes sense that consumers investing in beauty treatments and products would feel more comfortable spending their hard-earned dollars when they know who you are and why you do what you do. Recent studies have proven that people will invest more when there is a story attached to a brand. For example, an article on Adweek.com about marketing with stories describes how an eBay listing for a set of fi sh-shaped spoons with a brief description sold for $42.83. The same product with a short story attached sold for $70.08. People love stories; don't be afraid to tell yours. STEP 2: KNOW YOUR AUDIENCE A UBI needs to be relatable to the type of client you want to attract. For instance, if you specialize in acne facials for teens, you might go for a more clinical branding message. Even though your services are for teens, your branding message should speak to parents since they are most likely the ones to search for, book, and pay for teen acne services. Here's an example of how to incorporate steps 1 and 2: "My name is Beth and I specialize in acne facials. My mission is to help teens look and feel beautiful and confi dent. I personally remember when my mom took me for my fi rst facial. I was so excited to watch my skin clear and remember no longer being embarrassed to go to school. 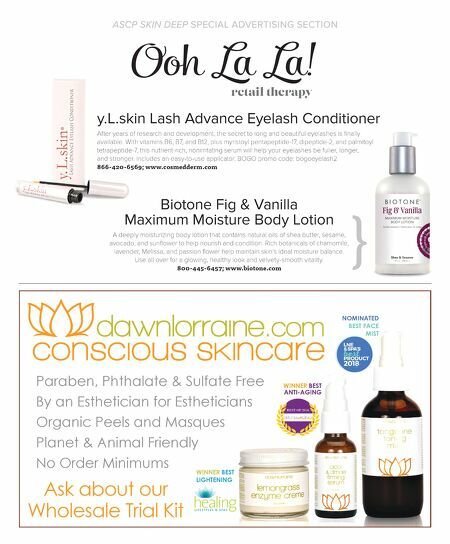 Restoring healthy skin and confi dence is a gift I hope to share with your child." STEP 3: CONSISTENCY According to Pam Moore, CEO of Marketing Nutz, it takes, on average, 5–7 brand impressions before someone will remember your brand. Just like acne treatments, more than one is needed to create a favorable result. A UBI only works if you use it consistently to share your message and let people know you are open for business. To be consistent, make sure your UBI is available everywhere: in all your marketing materials, your social media messages, and in your web and print design. Whether you are a solo practitioner, spa owner, or independent contractor, incorporating a UBI into your new client marketing will help you attract the right clients into your treatment room. 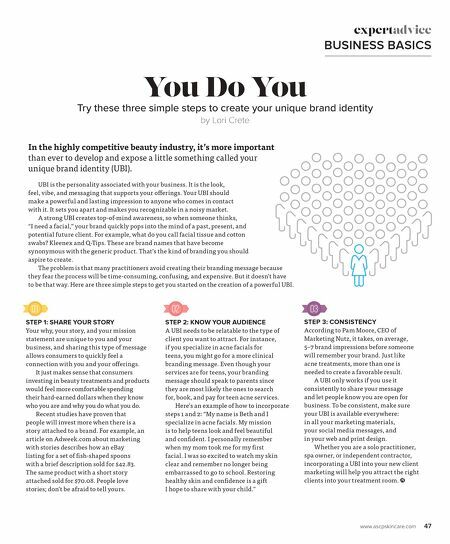 In the highly competitive beauty industry, it's more important than ever to develop and expose a little something called your unique brand identity (UBI). UBI is the personality associated with your business. It is the look, feel, vibe, and messaging that supports your off erings. Your UBI should make a powerful and lasting impression to anyone who comes in contact with it. It sets you apart and makes you recognizable in a noisy market. A strong UBI creates top-of-mind awareness, so when someone thinks, "I need a facial," your brand quickly pops into the mind of a past, present, and potential future client. For example, what do you call facial tissue and cotton swabs? Kleenex and Q-Tips. These are brand names that have become synonymous with the generic product. That's the kind of branding you should aspire to create. The problem is that many practitioners avoid creating their branding message because they fear the process will be time-consuming, confusing, and expensive. But it doesn't have to be that way. Here are three simple steps to get you started on the creation of a powerful UBI.